Kramer Chapel sits in a commanding position on the campus (designed by Eero Saarinen) of Concordia Theological Seminary in Fort Wayne, IN. 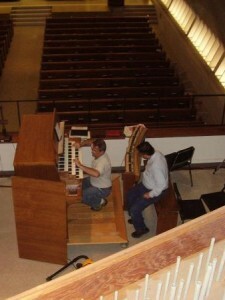 The 1958 Schlicker organ was designed in conjunction with the architect and consultant Paul Bunjes. As initially installed it cost $45,000, was dedicated to an overflow crowd by E. Power Biggs, and was a three manual and pedal and pedal electropneumatic action organ of 56 ranks. In 1970 Kurt Roderer made two additions – an 8’ Trompeta Real located atop the Swell enclosure, and a 1/4-length Pedal 32’ Contra Posaune, both on electromechanical windchests. In 1990 Fritz Noack was engaged to undertake tonal reregulation. 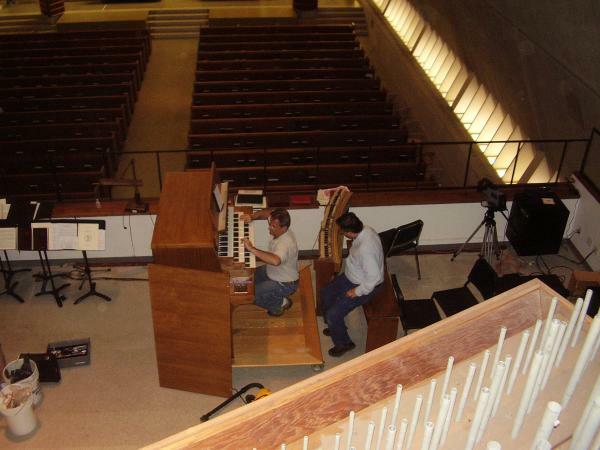 He also had his friend and colleague Dudley Terrell build and install a new console in the style of the original, as well as installing a solid state relay in the organ. At this time some manual stops were rearranged, and the 32’ Contra Posaune was retired in favor of a Pedal 8’ Trumpet, placed on the Roderer windchests. Buzard Pipe Organ Builders has been proud to serve as Curators of this important organ since 2000, in which year the windchests and wind system were completely releathered. In 2002 the instrument was cleaned. New windchests were crafted for the bass of the 8’ Pedal Trumpet, which was also extended upwards by 29 notes with new pipes and windchest and all original pipes revoiced. The stop is now also available at 8’ pitch on the Great. The number of memory levels in the combination action was increased from 8 to 32. The manual keyboards were to be rebushed, cleaned, and polished, but upon inspection it was determined that a better course of action was to fit new manual keys to the existing frames, which was undertaken at no additional charge to the customer. The existing pedalboard was rebuilt and fitted with a new contact assembly. The Trompeta Real, as is often the case with reeds from the 1970’s, had always been unsatisfactory in sound, primarily because the resonators were too short. A new pipe was crafted for Bottom C; the remaining pipes were shifted to speak one half-step higher; and the entire stop was revoiced for better blend and nobility of tone. The windchests for the bottom 12 pipes were converted to electropneumatic action, and a new windchest was be constructed for notes 13-61, using the existing toeboard and support racking. A new blower was supplied to provide the necessary wind pressure, using the existing reservoir.